Today sees the long-awaited and much-anticipated release of Mark Snow’s 4-disc soundtrack of his score from the television series run of The X-Files — filled with a wealth of never-before released material — by La La Land Records. Clocking in at a massive running time of 311 minutes, it contains music from "Pilot” all the way up to the series finale “The Truth” with many much lauded stops along the way, including a personal — and fan — favourite in “Scully’s Serenade” from the beginning of Season Eight. Full tracklisting and details on how to order are available at La La Land Records’ product listing. The release is limited to 3,000 copies, retails for the very reasonable price of $49.98 and, as if that were not enough, early orders will be autographed by Mark Snow whilst supplies last. And just take a look at that photo. Not only will this set boast over 5 hours of blissful music from across all nine seasons of the series but it is a thing of beauty, with much care having gone into its design. 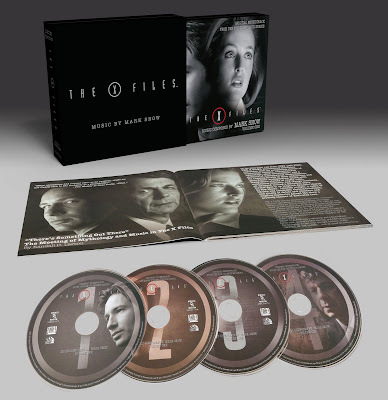 It also comes with an extensive booklet which includes the article “There’s Something Out There — The Meeting of Mythology and Music in The X-Files” by film music journalist Randall D. Larson. It’s an absolute must-have for fans of Mark’s highly influential music, which was of course also such a pivotal piece of the jigsaw in the style and tone of Millennium. 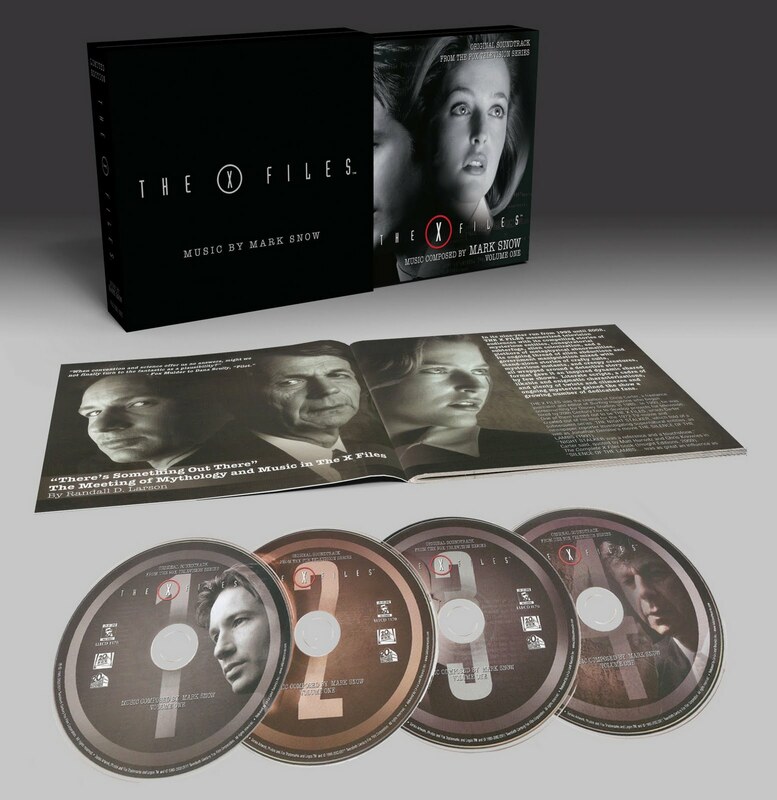 And not only is this the most definitive release of music from The X-Files to date, but it is tantalisingly subtitled Volume I, hinting at the possibility of more releases in the future. In fact, plans are already afoot to release Volume II next year. Rest assured I will be ordering a copy the very moment it comes on sale, and I urge you all to do the same since — just like the superb Millennium 2-disc set that came before it — this title will undoubtedly sell out fast. 4 Responses to "Mark Snow X-Files Soundtrack Released"
My gosh Adam. The allure of that box set was truly too striking to resist. I've been a big fan of those La La Land recordings but I had not been paying close enough attention that this was coming. I placed my order for the box set an hour ago only to be crushed by the news the autographs were all done. Oh well. That set looks more than worthy for the price of admssion. I'm quite thrilled about it and anticipate the set mightily. It looks like I'll have to get the Auto with the Volume II set. What an incredible package of music. Speaking of Snow and your mention of Millennium. I was stunned just how potent a score Snow created for that quiet, cerebral series. Some of the music was amazing. I really enjoyed his selections in The Thin White Line just to name one example. Hi SFF. Indeed - it's quite the package, eh? Sorry to hear you missed out on the signed ones, but - autographed or otherwise - I don't think it will be available for long at all, so you're very wise for ordering so soon! You're absolutely right, of course - Mark Snow's score for both series was phenomenal and so integral to the tone, but in the case of MIllennium it really was unusual in many respects, and helped to mark out the series as something quite unique in the canon of television. I'm quite positive we could do with another volume of as yet unreleased music from that series too! Fingers crosses for Volume II - times two! I completely agree. I knew I better grab it. There is significant material missing from both series especially Millennium. The Thin White Line is a good example. I'd love to see Volume IIs of Snow's scores. Amazing stuff really. My son said sincerely to me last night while I was watching Squeeze from The X-Files, "boy that's some great music." I'm formulating some ideas to conclude my Lance Henriksen post trilogy. I couldn't quite pull the third one off for John's mammoth and extraordinary blogathon, but I think it will get finished eventually just the same. Your site is a pleasure! Well said, SFF, and we look forward to the prospect of more from Mark Snow's rather overflowing back catalogue of music for the world of Ten-Thirteen. I look forward also to reading your further Lance Henriksen related material too, and thanks again - on behalf of the whole team - for your comments regarding the site.